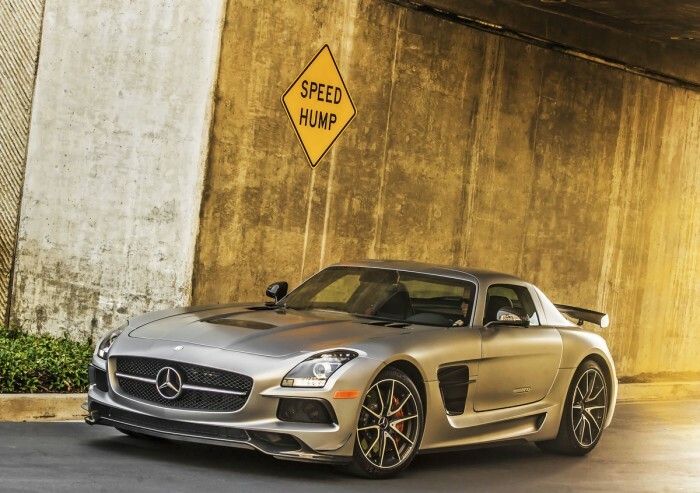 The 2014 Mercedes-Benz SLS AMG is a supercar, but it doesn’t really look the part. The sleek, sporty roadster is kind of a sheep in wolf’s clothing. Standard 19-inch front and 20-inch rear alloy wheels definitely deliver a commanding on-road presence, but it’s not quite indicative as to what is under the hood. Powering the 2014 Mercedes-Benz SLS AMG is an immense 6.2-liter V8 that pumps out 583 horsepower and 479 lb-ft of torque, and although that output helps propel the AMG from 0-60 mph in just 4.0 seconds, it gets better. Drivers that opt for the SLS AMG Black Series see those performance figures boosted to 622 horsepower and 486 lb-ft of torque. Super car and fuel economy are rarely said in the same sentence unless someone is talking about how bad there dragster is on gas. That being said, the 2014 Mercedes-Benz SLS AMG’s V8 returns 13 mpg city and 19 mpg highway – about what you would expect if not a smidge higher. Just getting inside the 2014 Mercedes-Benz SLS AMG is a treat thanks to gullwing-style doors that open by swinging upwards, and once you’re inside it does not disappoint. In addition to a sleek design layout and premium materials throughout, the 2014 AMG boast a slew of advanced features, including navigation, Bluetooth, six-CD changer, dual-zone automatic climate control, heated eight-way power seats, and an 11-speaker Bang & Olufsen surround-sound audio system. Standard safety features on the 2014 Mercedes-Benz SLS AMG includes an advance airbag system, traction and stability control, antilock disc brakes, and Mercedes’ mbrace emergency telematics system with automatic collision notification and stolen vehicle locator.